ISOGG, European Society of Human Genetics, Clogher Historical Society. Industrial Principal Scientist in London, with expertise in sample preparation, assay design/development, amplification technologies and bioinformatics. 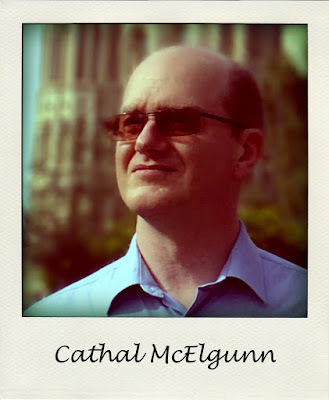 Project Administrator for the McElgunn family project. During my childhood, my father took me to see my great, great, great grandfather’s 1846 gravestone in South West Ulster. My father, together with a Monaghan man, had put together my paternal family tree back in the 1980’s. Distant relatives from North America and Australia occasionally visited my parents to trace their roots. At the close of 2008, I renewed my interest in both sides of my family tree realising that those with the knowledge would not be around for ever. I travelled to visit relatives in various parts of Fermanagh, Leitrim, Cavan, Donegal, Yorkshire and New Hampshire and transcribed their family narratives. I heard about my ancestors and relatives travels to locations as far away as Japan, Brazil, the Philippines, America and Scotland. Some of them were even lucky enough to return to Ireland. Fortunately, I learnt in 2008 that my maternal grandfather’s family tree had been drawn out by relatives in Long Island in 1967. This was added to with information from my mother and her cousin. From 2008 onwards I compiled the text narrative and subsequently built family trees on a number of the usual websites. These were even further expanded as I increased my experience with the genealogical databases and some of the main line siblings information was added, which helped later with genetic hits dependent on these siblings. My first test was taken back in 2016 and I immediately became intrigued with an anonymous individual with 2.5% similarity to me. It took me a year to identify that relative, who turned out to be fully explainable on the tree. However, along the way I contacted someone from Kerry on-spec that had matching paternal and maternal haplotypes to the 2.5% hit, on the off-chance that they might be that person. In the end that gentleman had a small similarity to some of my paternal relatives. A relative in Leitrim suggested that I contact the local newspapers in my home county to see if I could get my paternal grandfather’s obituary. The newspaper staff referred me to the local library and the gentleman there who replied with the obituary subsequently turned out to be a 2 segment hit in data from one of the companies. To understand the genetic history of my Westmeath ancestors who spent some years in Rio de Janeiro, I reached out to my only Brazilian genetic relative, an Irish Brazilian author who wrote about an Irish emigrant with the same surname and an American actress. This was one of these all too often discussed “brick walls”. I have used online tools to refine Y-haplotype from raw SNP data with older haplotype calls, have done autosomal transfers whenever possible and like to help genetic relatives, including adoptees, to figure out where their ancestry might lie. I am able to synergistically combine bioinformatics skill, easy familiarity with the Irish and British genealogy databases and a fascination for history towards occasionally constructing large trees having historical context. For my own part, I am interested in identifying the descendants of various emigrated ancestor siblings, in relating the variable ethnicity calls to historical situations, in explaining the connections to genetic relatives in unusual far flung locations and in pushing my tree back to the 17th century. Most of us will have used DNA data for genealogical purposes. However, many of the variations (single nucleotide polymorphisms or SNPs) that make up these datasets can also be used for understanding physical traits and health issues. These can be as uncontentious as tanning tendancy, red hair, digesting lactose, breaking down alcohol and smelling urinary asparagus. But, individual risks for complex diseases can also be examined using free or paid online tools. Some of the tools will be introduced and examples illustrated using simulated datasets. Issues to be discussed include the benefits and limitations of partial SNP datasets (as opposed to those that would be generated by Whole Genome Sequencing), the fact that de novo mutations are not identified by the currently used recreational DNA tests, and the potential implications for health insurance coverage. There could be a tremendous benefit in using our genetic information to predict, screen for and/or prevent disease states already encoded by our genes – if a compromise with profit can be made.